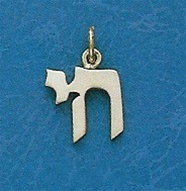 14K Gold Chai pendant. Small measures 1/2" fro m tip to tip; large measures 3/4". Chain not included.